As great as the internet can be, sitting down with an actual, physical book has its merits. It’s cozier. It reduces distractions. It’s more portable. You can give a book as a present (somehow a pdf just isn’t quite the same). But which one to choose? Instead of 5 or 10 books that might not be up your particular alley, here’s a giant list books on Paleo and related nutritional topics, organized by category. Each one comes with links to reviews (both positive and negative!) that highlight something useful about the book, and a little bit of basic information to help you decide if it sounds good to you. These aren’t necessarily books that you’ll completely agree with, or even that you should. They’re books that you may find interesting and worthwhile to read. A book can be interesting and worthwhile even if you disagree with part or all of it. It’s also OK to call out sloppy science, poor fact-checking, or just plain dumb arguments even if they happen to be coming from someone on your side. These are books that give a broad overview of what Paleo (or a very closely related diet, like Primal) is. Some of them are higher-carb; some are lower-carb, but all of them fall roughly under the Paleo umbrella. If you want to buy someone a book about Paleo to start them off, one of these books will probably be it. Most people probably don’t need to read more than one or two. Main argument: low-fat nutrition is bogus and we need to go back to whole foods (including but not limited to the titular yolks). Negative: critical review on Amazon, mostly from people who didn’t appreciate the familiarity of the tone, or who didn’t like how hard it was to look up references for the claims in the book. Diet recommendations: Very whole foods-centric: think Michael Pollan, if Michael Pollan were Paleo. Tone: very casual tone that not everyone responds to. History/culture or pure science? A little bit of both. Meal plans and recipes? No. Main argument: A lot of our modern health problems start with food. We need to eat foods that support healthy hormonal and psychological responses, gut health, and immune health. Diet recommendations: start with an ultra-strict version of Paleo for 30 days, and then reintroduce foods one at a time to see what you can tolerate. History/culture or pure science? Almost all science, with some motivational psychology. Meal plans and recipes? Yes. Main argument: it’s important to find a version of Paleo that works for you specifically, regardless of what the “rules” are. Here’s an excerpt published in Time magazine. Diet recommendations: start with a basic moderate-carb Paleo diet, and personalize it from there to meet your specific needs. Tone: approachable and readable, but not super informal. History/culture or pure science? Mostly science. Main argument: for better health, we should eat like our hunter-gatherer ancestors. Diet recommendations: high-protein, moderate-carb, moderate-fat Paleo with a lower-fat angle compared to some other Paleo books. 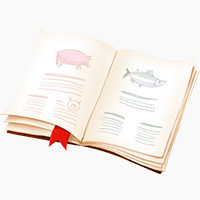 This book has two editions and the nutritional recommendations change from the first to the second. The first addition is lower in fat, negative about saturated fat, and accepting of canola oil. The second, updated edition, is much closer to the Paleo mainstream. Tone: authoritative, but not dry. History/culture or pure science? Some evolutionary history, but mostly science. Meal plans and recipes? Example menus, but no recipes. Main argument: we can improve our lives by getting back to our evolutionary roots. Negative: This negative review on Amazon is pretty caustic but raises some interesting points (you do have to look past the tone a little). Diet recommendations: generally high-fat, dairy-free Paleo, although the book isn’t focused so much on specific diet recommendations. Tone: accessible, but not extremely informal. History/culture or pure science? A little bit of both, with a big emphasis on the evolutionary backstory of Paleo. Main argument: low-carb Paleo and a Paleo approach to sleep, stress, and exercise have helped a lot of people; you should try it, too. Negative: a surprisingly critical (but well-thought-out!) review from the WAPF. Diet recommendations: very low-carb Paleo. Since writing the book, Robb Wolf has eased up on carb restriction, but the book is very centered on it. Tone: very casual tone that not everyone responds to. Some people find it obnoxious; other people love it. Main argument: to achieve optimal health, we should find the ideal range for each nutrient. Positive: Chris Masterjohn with review that praises the book overall but has some questions about macronutrient ratios and particular micronutrients. J. Stanton at gnolls.org has a review full of praise, and Chris Kresser also likes it. Diet recommendations: moderate-carb Paleo with a focus on highly nutritious foods and nutrient-density. Tone: not chatty, but approachable. This book would be good for people who find the informal tone of other intro books cutesy and irritating. History/culture or pure science? Almost all science. Meal plans and recipes? Very basic meal plan, but no recipes. Main argument: you should eat Paleo, and here’s how. Diet recommendations: basic moderate-carb Paleo approach; no dairy. Meal plans and recipes? Yes, including meal plans for various different conditions. Main argument: to regain our health, we need to learn from the diet and lifestyle habits of our pre-agricultural ancestors. The book covers diet, exercise, and other lifestyle factors like sleep and stress. Mixed: Anthony Dream Johnson at The Dream Lounge has an interesting review that praises the diet recommendations but disagrees with the exercise recommendations, another mostly-complementary review with some intelligent critique. Diet recommendations: mostly low-carb/high-fat Paleo; no grains or legumes; dairy as a less-bad option. Exercise recommendations focus on walking, lifting, and sprinting, not cardio. Tone: very casual; some people might find it too jokey. History/culture or pure science? mix of both. Main argument: evolutionary health requires a high-fat, low-carb ketogenic diet. Negative: negative reviews on Amazon mostly criticize it for being disorganized and hard to follow, or taking a scattershot approach instead of laying out one clear argument. Tone: accessible but not extremely causal. These books are either about specific aspects of Paleo (e.g. the autoimmune protocol) or about particular aspects of diet but not Paleo per se (e.g. vindication of dietary fat). Main argument: The food you eat affects your gene expression, which affects your health. For good health, we need to eat the traditional foods that support healthy gene expression. Mixed: a review from Melissa McEwan pointing out where she agrees and disagrees with the book. Diet recommendations: Eat the 4 “pillars of health:” meat on the bone (for cartilage and other important proteins), organ meats, raw foods, and fermented vegetables. Tone: slightly more literary and sometimes almost lyrical. Main argument: Dietary fat doesn’t cause heart disease; excess carbohydrates cause modern chronic disease, especially obesity. Positive: Katharine Czapp for the Weston A. Price Foundation and another complimentary review from Summer Tomato. Diet recommendations: low-carb, but not Paleo specifically. Tone: accessible but not super casual. Main argument: following the autoimmune protocol described in the book will help you heal from autoimmune disorders. Diet recommendations: Recommends her autoimmune protocol (Paleo without eggs, dairy, nightshades, nuts, or seeds) for people with autoimmune disorders. Ease of reading: medium-hard. It’s very science-heavy. History/culture or pure science? Almost entirely science. Meal plans and recipes? No, although in defense of the book, there’s an accompanying cookbook. Main argument: following the diet described in the book will help you heal from autoimmune disorders. Positive: a detailed review from The Paleo Mom and another detailed and positive review from The Paleo Drummer. This review from Phoenix Helix has a nice breakdown of what the book actually contains. Negative: a critical review on Amazon praising the personal story of the book, but questioning the support for some of the scientific claims. Diet recommendations: Outlines 3 levels of her diet protocol for people with autoimmune disorders. A key element of the diet is 9 cups of vegetables every day, plus elimination of gluten, dairy, and eggs. Meal plans and recipes? Meal plans, but no recipes. Main argument: Modern wheat and processed carbohydrates in general cause most of our modern health problems. Mixed: Summer Tomato points out that the book is very fuzzy about the distinction between wheat and carbohydrates, and this review from Dr. Yoni Freedhoff also points out that the actual diet is more Atkins-with-a-scare-story than wheat-elimination. Both are cautiously positive about the diet recommendations, but not for the reasons the author wants them to be. Diet recommendations: Gluten-free low-carb diet, with very low-carb/keto for diabetics. Tone: pretty informal, with some idiosyncratic names that might make some people cringe. Meal plans and recipes? Some recipes. Most of these books touch on nutrition at least a little bit, but they’re really focused on politics, history, and culture. Main argument: saturated fat and fat in general have been unfairly demonized and are actually important to good health. Diet recommendations: Low-carb/high-fat. If you’ve read Good Calories, Bad Calories (or anything else by Gary Taubes), this book will be very familiar. Tone: accessible but not overly familiar. History/culture or pure science? A mix of both (it’s the history of one particular strain of bad science). Main argument: the Food Pyramid was based on bad science and industry lobbying to start with, and it’s not doing our health any favors. Negative: here is a detailed and thoughtful critical review. History/culture or pure science? A little of both: she’s explaining the history of the science behind the Food Pyramid, so it’s all mixed together. Main argument: food corporations deliberately design foods to overwhelm our ability to tell when we’re full and make us crave more even when we don’t need it. Positive: Weighty Matters, the New York Times, and even more details from The Boston Globe. Negative: This review on Amazon criticizes the book for accepting too much Dietary Guidelines-style dogma about saturated fat, and for being too wordy in general. Diet recommendations: avoid processed food. Tone: accessible but not really informal. History/culture or pure science? A little of both: there’s a lot of history of food processing and development, but also some neurological/behavioral science about the brain. Main argument: agriculture (not just factory farms or industrial monoculture, but agriculture) is unsustainable. Goodreads (3.74 with 1,623 ratings). Positive: Dr. Eades has a glowing report, as does Mark Sisson, and the WAPF. Here’s a summary from Zoe Harcombe. Diet recommendations: None in particular, other than not-vegetarian. Tone: slightly literary and less down-to-earth than some other books about nutrition.